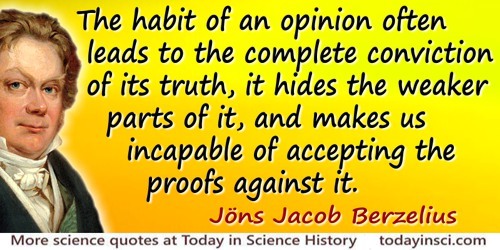 I cannot give any scientist of any age better advice than this: the intensity of the conviction that a hypothesis is true has no bearing on whether it is true or not. The importance of the strength of our conviction is only to provide a proportionally strong incentive to find out if the hypothesis will stand up to critical examination. In Advice to a Young Scientist (1979), 39. A great man, [who] was convinced that the truths of political and moral science are capable of the same certainty as those that form the system of physical science, even in those branches like astronomy that seem to approximate mathematical certainty. He cherished this belief, for it led to the consoling hope that humanity would inevitably make progress toward a state of happiness and improved character even as it has already done in its knowledge of the truth. A habit of basing convictions upon evidence, and of giving to them only that degree or certainty which the evidence warrants, would, if it became general, cure most of the ills from which the world suffers. In Bertrand Russell and Paul Edwards (ed. ), 'Preface', Why I Am Not a Christian: And Other Essays on Religion and Related Subjects (1957), vi. First sentences in When Prophecy Fails (1956), 3. As children we all possess a natural, uninhibited curiosity, a hunger for explanation, which seems to die slowly as we age—suppressed, I suppose, by the high value we place on conformity and by the need not to appear ignorant. It betokens a conviction that somehow science is innately incomprehensible. It precludes reaching deeper, thereby denying the profound truth that understanding enriches experience, that explanation vastly enhances the beauty of the natural world in the eye of the beholder. As for types like my own, obscurely motivated by the conviction that our existence was worthless if we didn’t make a turning point of it, we were assigned to the humanities, to poetry, philosophy, painting—the nursery games of humankind, which had to be left behind when the age of science began. The humanities would be called upon to choose a wallpaper for the crypt, as the end drew near. From More Die of Heartbreak (1987, 1997), 246-247. As translated by R.J. Hollingdale (trans.) in Human, All Too Human: A book for Free Spirits (1878/1996), Part 1, 179, aphorism 483. Do not enter upon research unless you can not help it. Ask yourself the “why” of every statement that is made and think out your own answer. If through your thoughtful work you get a worthwhile idea, it will get you. The force of the conviction will compel you to forsake all and seek the relief of your mind in research work. From Cameron Prize Lecture (1928), delivered before the University of Edinburgh. As quoted in J.B. Collip 'Frederick Grant Banting, Discoverer of Insulin', The Scientific Monthly (May 1941), 52, No. 5, 473. Geology and Mineralogy Considered with Reference to Natural Theology (1836), Vol. 1, 9. Gradually, at various points in our childhoods, we discover different forms of conviction. There’s the rock-hard certainty of personal experience (“I put my finger in the fire and it hurt,”), which is probably the earliest kind we learn. Then there’s the logically convincing, which we probably come to first through maths, in the context of Pythagoras’s theorem or something similar, and which, if we first encounter it at exactly the right moment, bursts on our minds like sunrise with the whole universe playing a great chord of C Major. In short essay, 'Dawkins, Fairy Tales, and Evidence', 2. I would... establish the conviction that Chemistry, as an independent science, offers one of the most powerful means towards the attainment of a higher mental cultivation; that the study of Chemistry is profitable, not only inasmuch as it promotes the material interests of mankind, but also because it furnishes us with insight into those wonders of creation which immediately surround us, and with which our existence, life, and development, are most closely connected. Familiar Letters on Chemistry (1859), 4th edn., 1. If any layman were to ask a number of archaeologists to give, on the spur of the moment, a definition of archaeology, I suspect that such a person might find the answers rather confusing. He would, perhaps, sympathize with Socrates who, when he hoped to learn from the poets and artisans something about the arts they practised, was forced to go away with the conviction that, though they might themselves be able to accomplish something, they certainly could give no clear account to others of what they were trying to do. Opening statement in lecture at Columbia University (8 Jan 1908), 'Archaeology'. Published by the Columbia University Press (1908). In The Order of Nature (1917), 92. It may be appropriate to quote a statement of Poincare, who said (partly in jest no doubt) that there must be something mysterious about the normal law since mathematicians think it is a law of nature whereas physicists are convinced that it is a mathematical theorem. Quoted in Mark Kac, Statistical Independence in Probability, Analysis and Number Theory (1959), 52. From Letter (24 Mar 1954) in Einstein archives. Quoted by Helen Dukas and Banesh Hoffman, Albert Einstein: The Human Side (1979, 2013), 43. Dukas was Einstein’s personal secretary for 28 years, so she knew his philosophy well. As quoted in obituary, 'Einstein Noted as an Iconoclast In Research, Politics and Religion', The New York Times (19 Apr 1955), 25. No physiologist who calmly considers the question in connection with the general truths of his science, can long resist the conviction that different parts of the cerebrum subserve different kinds of mental action. Localization of function is the law of all organization whatever: separateness of duty is universally accompanied with separateness of structure: and it would be marvellous were an exception to exist in the cerebral hemispheres. The Principles of Psychology (1855), 607. Ordinary knowledge is awareness of external facts; ordinary belief, conviction on inadequate grounds. That deeply emotional conviction of the presence of a superior reasoning power, which is revealed in the incomprehensible universe, forms my idea of God. Swarthmore Lecture (1929) at Friends’ House, London, printed in Science and the Unseen World (1929), 42-43. The evidence at present available points strongly to the conclusion that the spirals are individual galaxies, or island universes, comparable with our own galaxy in dimension and in number of component units. In Aleksandr Sergeevich Sharov and Igor Dmitrievich Novikov, Edwin Hubble: The Discoverer of the Big Bang Universe (1993), 27. The geologist, who is blest with an assured conviction of the immensity of geological time, moves with an ease and freedom from cause to effect wholly denied to those wanting in this conviction. In 'The Relations of Geology', Scottish Geographical Magazine (Aug 1902), 19, No. 8, 398. The highest court is in the end one’s own conscience and conviction—that goes for you and for Einstein and every other physicist—and before any science there is first of all belief. For me, it is belief in a complete lawfulness in everything that happens. Letter from Planck to Niels Bohr (19 Oct 1930). As cited in J. L. Heilbron, The Dilemmas of an Upright Man: Max Planck As Spokesman for German Science (1987), 143. The natural scientists of the previous age knew less than we do and believed they were very close to the goal: we have taken very great steps in its direction and now discover we are still very far away from it. With the most rational philosophers an increase in their knowledge is always attended by an increased conviction of their ignorance. Aphorisms, trans. R. J. Hollingdale (1990), 89. The scientist has to take 95 per cent of his subject on trust. He has to because he can't possibly do all the experiments, therefore he has to take on trust the experiments all his colleagues and predecessors have done. Whereas a mathematician doesn't have to take anything on trust. Any theorem that's proved, he doesn't believe it, really, until he goes through the proof himself, and therefore he knows his whole subject from scratch. He's absolutely 100 per cent certain of it. And that gives him an extraordinary conviction of certainty, and an arrogance that scientists don't have. Essay, 'Private Games', in Lewis Wolpert and Alison Richards, (eds. ), A Passion for Science (1988), 61. This conviction of the solvability of every mathematical problem is a powerful incentive to the worker. We hear within us the perpetual call: There is the problem. Seek its solution. You can find it by pure reason, for in mathematics there is no ignorabimus! Ignorabimus as used here, means “we will not know” (which is slightly different from ignoramus meaning present ignorance, “we do not know”). In Lecture (1900), 'Mathematische Probleme' (Mathematical Problems), to the International Congress of Mathematicians, Paris. From the original German reprinted in David Hilbert: Gesammelte Abhandlungen (Collected Treatises, 1970), Vol. 3, 298, “Diese Überzeugung von der Lösbarkeit eines jeden mathematischer Problems ist uns ein kräftiger Ansporn während der Arbeit ; wir hören in uns den steten Zuruf: Da ist das Problem, suche die Lösung. Du kannst sie durch reines Denken finden; denn in der Mathematik gibt es kein Ignorabimus. English version as translated by Dr. Maby Winton Newson for Bulletin of the American Mathematical Society (1902), 8, 437-479. The address was first published in Göttinger Nachrichten is Nachrichten von der Königl. Gesellschaft der Wiss. zu Göttingen (1900), 253-297; and Archiv der Mathematik und Physik (1901), 3, No. 1, 44-63. Thus you can throw yourself flat on the ground, stretched out upon Mother Earth, with certain conviction that you are one with her and she with you ... For eternally and always there is only now, one and the same now; the present is the only thing that has no end. Twenty centuries of “progress” have brought the average citizen a vote, a national anthem, a Ford, a bank account, and a high opinion of himself, but not the capacity to live in high density without befouling and denuding his environment, nor a conviction that such capacity, rather than such density, is the true test of whether he is civilized. In Game Management (1933), 423. We Buddhists have always held that firm conviction that there exists life and civilization on other planets in the many systems of the universe, and some of them are so highly developed that they are superior to our own. When I look back upon the past, I can only dispel the sadness which falls upon me by gazing into that happy future when the infection [puerperal fever] will be banished. But if it is not vouchsafed for me to look upon that happy time with my own eyes … the conviction that such a time must inevitably sooner or later arrive will cheer my dying hour. [Webmaster note: He had identified that puerperal fever was transmitted to women by the “cadaveric material” on the hands of physicians coming direct from the post-mortem room to an examination. He discovered that washing the physician’s hands in a solution of chlorinated lime prevented the transmission of this disease. His doctrine was opposed by many, and he died in an insane asylum in 1865, at age 47.] Original publication, Die Aetiologie, der Begriff und die Prophylaxis des Kindbettfiebvers (1861), trans. by F.P. Murphy as The Etiology, the Concept, and the Prophylaxis of Childbed Fever (1941), Foreword. As quoted in Francis Randolph Packard (ed. ), Annals of Medical History (1939), 3rd Series, 1, 94; and Stephen Jay Gould, Hen’s Teeth and Horse’s Toes: Further Reflections in Natural History (1985), 274. Whether true or false, others must judge; for the firmest conviction of the truth of a doctrine by its author, seems, alas, not to be the slightest guarantee of truth. Letter (1 May 1857) to Alfred Russel Wallace. In Sir Francis Darwin (ed. ), The Life and Letters of Charles Darwin (1887), 454. While it is true that scientific results are entirely independent from religious and moral considerations, those individuals to whom we owe the great creative achievements of science were all of them imbued with the truly religious conviction that this universe of ours is something perfect and susceptible to the rational striving for knowledge. If this conviction had not been a strongly emotional one and if those searching for knowledge had not been inspired by Spinoza's Amor Dei Intellectualis, they would hardly have been capable of that untiring devotion which alone enables man to attain his greatest achievements. In response to a greeting sent by the Liberal Ministers’ Club of New York City, published in 'Religion and Science: Irreconcilable?' The Christian Register (Jun 1948). Collected in Ideas and Options (1954), 52. [I have] a strong conviction that controversial reply and rejoinder is but a vain occupation. In letter (11 Mar 1843) to R. Taylor, collected in Experimental Researches in Electricity (1844), Vol. 2, 274-2755. Published earlier as 'On Dr. Hare’s Second Letter, and on the Chemical and Contact Theories of the Voltaic Battery', London and Edinburgh Philosophical Magazine (1843), 23. [Microscopic] evidence cannot be presented ad populum. 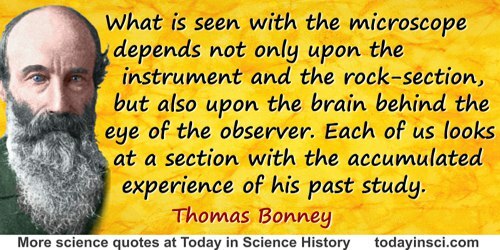 What is seen with the microscope depends not only upon the instrument and the rock-section, but also upon the brain behind the eye of the observer. Each of us looks at a section with the accumulated experience of his past study. Hence the veteran cannot make the novice see with his eyes; so that what carries conviction to the one may make no appeal to the other. This fact does not always seem to be sufficiently recognized by geologists at large. 'The Anniversary Address of the President', Quarterly Journal of the Geological Society of London, 1885, 41, 59.